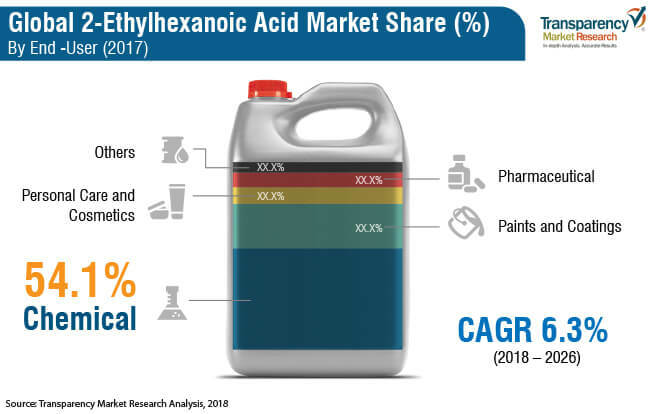 The global 2-ethylhexanoic acid market was valued at US$ 850.38 Mn in 2017 and is anticipated to expand at a CAGR of 6.3% from 2018 to 2026, according to a new report titled ‘2-Ethylhexanoic Acid Market: Global Industry Analysis, Size, Share, Growth, Trends, and Forecast, 2018–2026,’ published by Transparency Market Research (TMR) . The global 2-ethylhexanoic acid market is driven by rise in the demand for PVB plasticizers and PVC stabilizers. Asia Pacific accounts for a major share of the global 2-ethylhexanoic acid market. The plasticizers market in Asia Pacific is expanding, with several regional and medium-sized companies being highly active in the region. Plasticizers with high polarity such as 2-ethylhexanoic acid are highly compatible with PVB (polyvinylbutyral). Demand for 2-ethylhexanoic acid for use in the manufacture of PVB plasticizers is on the rise. PVB plasticizers are, in turn, used in the glass industry. Use of 2-ethylhexanoic acid as a PVB plasticizer imparts superior impact resistance and high tensile strength to the end-product. Rising use of PVB films and sheets in building & construction and infrastructure industries is expected to augment the demand for 2-ethylhexanoic acid during the forecast period. Rising demand for chemical stabilizers such as 2-ethylhexanoic acid is ascribed to the ability of 2-ethylhexanoic acid to prevent the elimination of hydrogen and chlorine molecules from the PVC. PVC stabilizers are employed in various applications such as pipes and fittings, window profiles, rigid and semi-rigid films, wires, cable coatings, and flooring. Currently, the demand for PVC stabilizers such as 2-ethylhexanoic acid is driven by significant growth of the building & construction industry in Asia Pacific. 2-Ethylhexanoic acid is suitable for use from environment, health, and safety aspects. These factors are enhancing the demand for 2-ethylhexanoic acid for use in PVC stabilizers. Automotive engine cooling systems contain a variety of metals such as copper, brass, steel, cast iron, aluminum, magnesium, and their alloys. Chances of a corrosive attack on such metals is high, due to presence of various ions, high temperatures and pressures, and high flow rates in a majority of cooling systems. Use of 2-ethylhexanoic acid as a corrosion inhibitor prevents failure of engine components. This is anticipated to provide attractive growth opportunities to the 2-ethylhexanoic acid market during the forecast period. Chemical applications of 2-ethylhexanoic acid primarily include polyvinylbutyral plasticizers and PVC stabilizers. When used as a plasticizer, 2-ethylhexanoic acid improves the solubility of polyvinylbutyral. This, in turn, helps in the glass manufacturing process. 2-Ethylhexanoic acid has the ability to prevent emission of hydrogen and chlorine. Thus, it is ideal for use as a PVC stabilizer. 2-Ethylhexanoic acid is used as a chemical intermediate in the manufacture of synthetic lubricants. In developed countries, regulations imposed on the emission of volatile organic compounds necessitate the use of water-based coatings. Water-based coatings do not require any drying agent. Since drying agents are not required in water-based coatings, the demand for 2-ethylhexanoic acid for use in these applications is likely to reduce eventually. Thus, emergence of water-based coatings is likely to act as a restraining factor for the global 2-ethylhexanoic acid market during the forecast period. In terms of consumption, Asia Pacific accounted for a major share of the global 2-ethylhexanoic acid market in 2017. Asia Pacific has emerged as a hub for manufacture and exports of chemicals over the last few years. This has prompted various world-leading companies to strengthen their position in the market in the region. For example, BASF, along with PETRONAS, has started a new manufacturing facility for 2-ethylhexanoic acid in Kuantan, Malaysia. The rapidly growing middle-class population is also considered a major factor driving end-user industries of 2-ethylhexanoic acid in Asia Pacific. Countries such as China, Japan, and India are spearheading the automotive production in Asia Pacific. These countries are considered leading consumers of 2-ethylhexanoic acid that is used in paint dryers. Japan is considered a major hub for production of 2-ethylhexanoic acid in Asia Pacific. Rise in the middle-class population, especially in China and India, is likely to augment the demand for 2-ethylhexanoic acid in the region during the forecast period. Key players profiled in the report include The Perstorp Group, BASF SE, The Eastman Chemical Company, Elekeiroz, and OXEA Chemical Company. Manufacturers use the butyraldehyde method for production of 2-ethylhexanoic acid. Manufacturers’ strategy of expansion in developing economies is likely to strengthen their business operations and position in the global 2-ethylhexanoic acid market in the next few years.